May is the anniversary of the birth of noted civil engineer and inventor James Buchanan Eads, best known for his triple-arch steel bridge over the Mississippi River at St. Louis, MO. Born in Lawrenceburg, IN, on May 23, 1820, Eads was named after his mother’s cousin, James Buchanan, who later became the 15th president of the United States. Eads received no formal education after the age of 12. 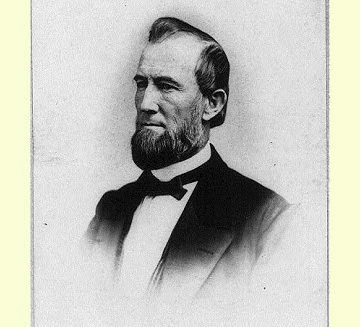 In 1833, Eads’ father moved the family to St. Louis. The steamboat on which they took passage was burned and all of their household goods were destroyed. Rather than schooling, Eads found himself needing to assist in the support of the family, and engaged in selling apples from a cart. 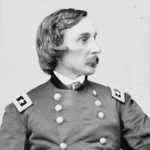 He educated himself by reading books on physical science, mechanics, machinery, and civil engineering in the library of his second employer, a St. Louis dry goods merchant. His next employment was that of purser on a steamboat on the Mississippi River. While working as a clerk on the steamboat, Knickerbocker, which was carrying a cargo of lead, a snag ripped open its bottom, sinking it to the riverbed. 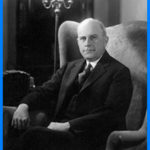 This was the second time Eads had been involved in a steamboat accident, which inspired him to develop a means to recover riverboat salvage from the bottom of the river. By 22, he had invented a salvage boat and diving bell that led to a profitable business for the next 12 years. After the start of the Civil War in 1861, Eads was consulted by the U.S. Attorney General regarding the defense of the Mississippi River. Eads proposed that ironclad steam-powered warships of shallow draft be built to operate on the rivers. Soon afterward, he was contracted to construct the city-class ironclads for the U.S. Navy, and within five months, produced seven such ships – USS Cairo, Carondelet, Cincinnati, Louisville, Mound City, Pittsburg, and St. Louis (later renamed Baron De Kalb). Senior officers, including Generals Grant and Sherman, agreed that Eads and his vessels had been vital to early Union victories in the West. When railways began to replace waterways as the highways of commerce, Eads shifted his attention from steamboats to trains. 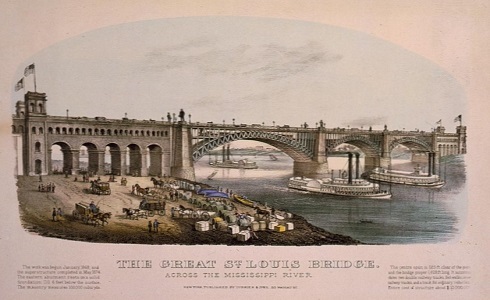 Eads designed and built the first road and rail bridge to cross the Mississippi River at St. Louis. The Eads Bridge, constructed 1867-1874, was the first bridge of a significant size with steel as its primary material, and it was the longest arch bridge in the world when completed. Eads was the first bridge builder to employ the cantilever method, which allowed steam boat traffic to continue using the river during construction, and he was the first to use pneumatic caisson in the construction of bridge piers. In 1874, Eads again influenced Mississippi River transportation. 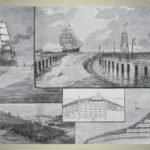 The 100-mile-plus section of the Mississippi between the port of New Orleans and the Gulf of Mexico frequently suffered from silting up of its outlets, stranding ships or making parts of the river unnavigable for a period of time. Eads thought that the U.S. Army Corps of Engineers’ plan to build a canal as a solution was outrageous. Instead, Eads designed a self-scouring channel through the South Pass by constructing wing dikes, perpendicular to current flow, forcing the current into a narrower cross-section. The current scoured the river bottom, pushing the silt far out into the deep Gulf waters, creating a nearly permanent channel that required only periodic dredging to maintain navigability. Eads died in Nassau, Bahamas on March 8, 1887 at the age of 66 and was buried in Bellefontaine Cemetery in St. Louis. Eads Bridge, one of few bridges named for its engineer, is still in use today, carrying both automobile and light rail traffic over the river. The Eads Bridge was the iconic symbol of the City of St. Louis until the construction of the Gateway Arch in 1965. 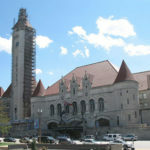 It was designated a National Historic Landmark in 1964 and recognized as a National Historic Civil Engineering Landmark in 1971. Eads South Pass Navigation Works was recognized as a National Historic Civil Engineering Landmark in 1982.